I’ve been thinking a lot about cachaca recently. This is not unconnected to receiving a couple of samples from Anthony at Abelha Cachaca the other day. It might be the third most popular spirit in the world, but cachaca is in pretty similar position to that of vodka in the 1950s/60s – there is a global awareness of the product, but the majority of the spirit produced is not exported and it hasn’t quite hit the mainstream in the export markets yet. Wikipedia suggests that only 1% of the 1.3 billion litres of cachaca produced annually are exported. While the availability of cachaca outside of Brazil is on the increase, we’re still at the stage where there are only a handful of notable brands – Sagatiba, Germana, Ypioca, to name three. This is probably an excellent time to launch an organic, artesanal brand into the UK market. But I tend to be pretty busy most days, what with the working and the not working and the sleeping and the not going to Tales of the Cocktail, so it’s helpful that Abelha have been bringing some over for a couple of months now. Both expressions are small batch, artesanal (pot-distilled, as opposed to the column distilled “industrial” style) cachacas – the Silver is unaged while the Gold is aged for three years in small (250ltr) Brazillian hardwood barrels. I’ll write about the Gold in more depth tomorrow, but I was completely blown away by the Silver. On the nose it has those familiar vegetal notes that come with cachacas and rhums agricole, but it also has a pleasant honey scent with a touch of citrus to it. The mouth feel is great – a slightly viscous texture, with a strong finish but without chemical burn of column-still spirit. Esquire just listed Abelha as one of its top three cachacas, but I’m not sure if you need the other two. Unfortunately, the sampler I got wasn’t big enough to try in some spirit/mixer combos, but there was just enough to make up a couple of cocktails. The first thing I did was based around the other classic cachaca cocktail, the Batida. It’s the Caipirinha’s longer, more laid back cousin and totally deserving of some of the love thrown at the little peasant drink. I ended up crossbreeding it with a Smash, with the intention of coming up with something fruity for summer. Shake all the ingredients with ice and strain into an old-fashioned/rocks glass over crushed ice. Feel free to add a touch of gomme/simple syrup into the shaker to taste. Garnish with a grapefruit slice and a mint sprig. After that, I decided to go old-school. 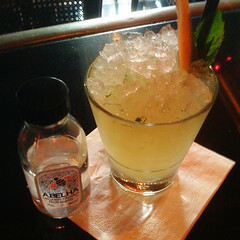 Cachaca tends to be used in caipirinhas and long punch-style drinks and not a lot else, but the Abelha Silver struck me as something that would work really well as an alternative to a white rum. 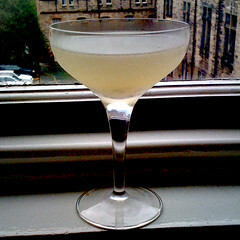 So, I went with a simple mod of a daiquiri. Shake all ingredients with ice and fine-strain into a chilled martini/coupette glass. Twist a lime zest over the top and discard. Garnish with a cocktail cherry. And tomorrow? Tomorrow, I’m getting to know the Abelha Gold.